This video is about making a home made CALZONE with my own pizza sauce. Its quick and easy to make! Great for when your in a hurry but don’t have the time to cook. ENJOY! Heat a frying pan. Saute onion slices in melted butter. Add ground beef and brown well. Add mushroom and mix well. Once cooked, turn off the heat and transfer the mixture to a bowl. Allow to cool. Spread the store bought pizza dough sheet into square shape and spread ricotta cheese over it (on one end as shown in the video). Place pepperoni slices over it and top with prepared mixture. Grease baking pan with oil spray. 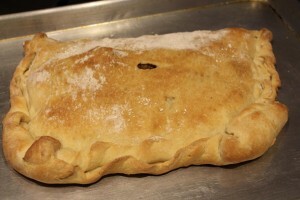 Transfer the calzone to pan and pop into oven. Serve with pizza sauce and enjoy!